LIVESTRONG Day, Lance Armstrong Foundation's (LAF) grassroots advocacy initiative to unify people affected by cancer and to raise awareness about cancer survivorship issues on a national level and in local communities across the country. LIVESTRONG Day 2007 will occur on Wednesday, May 16. Those of you who know Barbara, will also know that she has cancer. One day she hopes she will be able to call herself a cancer survivor. Nothing would make me happier. Earlier this year, after having my first mammogram at the age of 40 I had to have an operation to have a lump removed from my breast. Luckily for me, it turned out to be benign. Barbara has not been so lucky, but despite her own suffering, she never failed for one second to be a positive and unfailing support to me throughout my own ordeal. Even though I have never met her! Barbara sent me assurances and advice through email and via google chat. She was my guiding, golden star. To support Barabra's own efforts to raise awareness is the least I can do, especially since it gave me an excuse to make a glorious English-style Baked Custard Tart that was the best I have ever tasted. From reading I have done on the internet (who knows if it is to be trusted), the English have been making custard tarts at least since Medieval times. 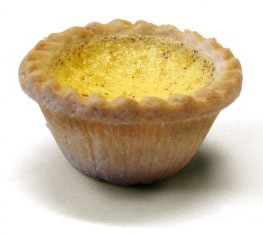 Growing up in Britain, commercially-made individual custard tarts that looked like this, were ubiquitous in every neighbourhood bakery. I have to confess, that although I loved the eggy, nutmeg-speckled filling of these little tarts, I detested the often-soggy, pale insipid shortcrust pastry that held the custard in place. Although he tendered the intial inspiration, I didn't actually use Wareing's recipe to make my fabulous tart. I had some pate sucree, rich pastry containing almonds, eggs and sugar, in my freezer (from my favourite Pierre Herme recipe in The Cooks Book) and I used that for the shell. I baked it blind for 10 minutes before removing the beans, brushing it with beaten egg and then baking another 10 minutes to form a glaze that word deter the custard from leaking through the dough. I use pate sucree all the time when it is not called for. Why? Because I love it the most. Who cares if you are meant to use soggy shortcrust for Bakewells and Custard tarts? I don't like shortcrust nearly so much, so I am going for the decadent pate sucree every time instead, so there. 2006 | "The Best Thing You Ever Did"
2005 | "It's Like a Starter You Could Have in a Fanncy Restaurant"
Look good but not my cup of tea! I actually tried Marcus Wareing's recipe (twice!) and I though it was gobsmockingly good (my family loved it too). Sam thanks for your support of A Taste Of Yellow. I love a good custard tart. Pate sucree sounds like a brilliant change to the original shortcrust. Sam that looks good it was always a favourite of my granny she used to make them for my dad. Thank you for sharing Barbara's story and event. She sounds amazing! And what a beautiful tart! Oh man...I hope your friend gets better! Sam, I just read your update. So sorry to hear about your friend. I will be sending positive thoughts in the northeasterly direction of Wales, and wishing her the strength of heart she will need to get through this. The last picture is very impressive to me. I hope your friend getting well soon. *hug* Good thoughts being sent. Lots of positive thoughts coming from me too Sam. I know she will gain strength from your support at this awful time. Your custard tart looks delicious, I am pretty ambivalent about shortcrust pastry so your option sounds perfect. My best wishes are with your friend. really sorry to hear about your friend - what devastating news. i know what you must be feeling - and you're probably asking why, why, why. it's not easy to be so helpless, i hate situations where you cannot effect anything positive, no matter how much you want to or how hard you try. i hope she'll have some more positive news soon... the waiting is the worst part, i guess. my thoughts are with her and with you! if i didn't know better, i could almost swear that was me on the right in that picture. that's weird. So sorry to hear the news Sam. I am sending all my positive energy her way. You both are georgous. I grew up in Cardiff and Gloucestershire and I'm 42, so I have some pics with me looking exactly like you two...adorable. Please, please, send my best thoughts to your friend. Love you, love your blog...and good thoughts to all. Now living in San Diego, ex SF. thanks to everyone for all the good vibes you are sending to Sheena. Caroline - Sheena lives in Wales so the comarsion is even stronger. We are keeping our fingers crossed for her. I wish your friend the very best. She's lucky to have a friend like you...although I hope you got her permission to put that Solid Gold Dancer-like picture on your site! I tried Marcus' recipe about three times and every time the pastry slid down the sides in a stodgy mess. I'm wondering whether it was the tin I used. I ended up making it in a shallow tart tin which eventually worked and it did taste good but was quite thin. I might try your recipe instead. 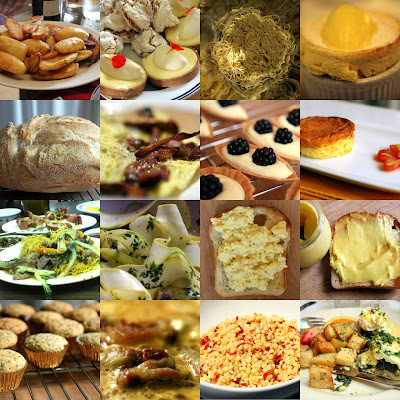 I am a new visitor to your blog - I love it, and your tart! This is a wonderful post and lovely tribute to Barbara. I am sorry to learn of your friend's diagnosis. Your friendship is/will be a comforting thing for her. Sam, that's terrific tart! My sympathy to your friend. I am glad I have got rid of the cancer I got before, and really really am hoping it won't come back. that custard tart looks delicious. My name is Jo and I live in St. Cloud, Minnesota. 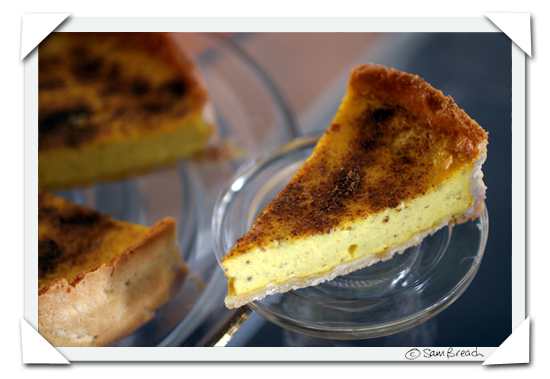 Just found your blog when I was looking for an English Custard tart recipe. Then I noticed your note about Sheena. I'm so very sorry. How is she doing, though I know its June 2009 thought I would ask? Thanks for asking. Sadly she died just over a year and a half ago. I did get to go and see her one last time which gave me some comfort.